Holidays can be stressful and full of laughter. Either way, here are some funny Christmas wishes to keep the fun going. May your Christmas day be filled with love. Just as Santa does in his sleigh. I hope you stuff yourself up with lots of food, so you'll be able to play a great Santa for next year! Don't forget to find your holly jolly spirit. It is Christmas after all!! Stressful Christmases are no fun! Wishing you a stress-free holiday, which unfortunately will probably only be when its all over! Another year and another Christmas. Hoping this year you can stay away from the egg nog and remember all the fun times! Over the holidays, people either want to be all in or hibernate like a bear. This is because if they don�t hibernate, they actually act like a bear! Wishing you presents from Santa and not his reindeer. Your lawn has been looking so great these days! I�ve heard that its the thought that counts! Keep in mind, cash and gift cards do the trick too! 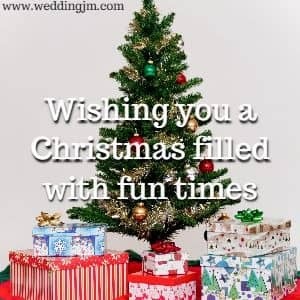 Wishing you a Christmas filled with fun times without the financial hole that we tent to dig for ourselves! Christmas is filled with white fluffy snow that kids love to eat. Just waiting until they taste the yellow kind for them to decide they�ve had enough! May you find yourself under the mistletoe this year where many kisses await. Wishing you a Christmas like Santa�s vacation after he finishes delivering all his toys. Sound to sleep in his warm cozy bed! May your Christmas be filled with rum filled egg nog so you can save some of your sanity for Boxing Day! Hoping you receive everything you deserve this Christmas. Although, that could go either way, you may just want to ask for a sweater to be safe! Don�t be a Grinch this Christmas! Leave that to the professionals! There is one in every family! Prepare the egg nog, coffee or whatever you need to get you through the holidays. They are coming and there is nothing you can do about it! We wish you a dabbing Christmas and a dabbing New Year! Don�t let the calories of Christmas make you feel guilty. Its almost the start of a new year! Hope you got your flu shot to allow you to enjoy all the festivities of the holidays and none of flu season! May Christmas dinner be everything you have waited all year for and more! Happy eating! Hoping you receive warm socks this winter. Looks like its going to be a long and cold one! If you didn't receive a response to your letter to Santa when you told him you were good all year long, it might be because Santa is still rolling around laughing! 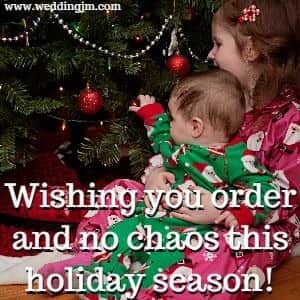 Wishing you order and no chaos this holiday season! But knowing your family, this is probably not a realistic wish for you! Wishing you added sanity, you're going to need it! Its so fun to enjoy Christmas with all it has, but its much more fun to have goofy relatives like you along for the ride! Gotta say, I love love love it when Christmas day is over and all the crazies (my relatives) have gone home. I actually am starting to think that Boxing Day may be my favourite holiday! But I do miss you all when the house is clean and quiet! Happy Holidays with even more happy glasses of wine being poured around to make all our happy memories! This Chrismas I wish for all my family and friends to eat great food, laugh more than expected and allow the egg nog to make it through supper. Thanks for being a great holiday host. If it weren't for you, well, I think we might actually starve on Christmas. Or we would just get really, really drunk.